Wow, now this one we didn’t expect! Lily Allen, following her heartfelt protestations that Mandelson’s plans to cut off the internet connections of ‘persistent file sharers’ were destroying opportunities for hard-working record labels to put money into young bands, has flipped to the polar opposite position. 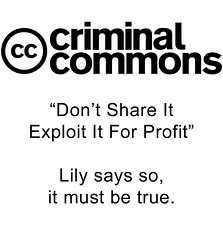 No, she’s not saying file-sharing is OK. She’s now saying that it’s only bad if you DON’T charge for it. Yup, she’d rather you bought bootleg copies of her album from the crim in your local market than got it from a friend who bought it legitimately. than people listening to music because they love it and paying for it because they’re grateful for it, or want something physical, something that can’t be downloaded. Her ideas represent a very peculiar form of anarcho-capitalism, that sees the exchange of currency as the only real value in any action, and that the right to do that should be promoted and upheld in spite of any negative social, creative, criminal or legislative consequences. So if that means protecting the rights of media conglomerates to exploit the assets of legacy works that by most reckoning ought to be in the public domain, then so be it. And, indeed, if it means the suggestion that “illegal” transfer of music is only valid if the person doing the transfer is personally profiting from it, then so be that as well. Just so long as the unworthy scum that are actually listening to her music realise that it’s worth some cash. It takes Mandelson’s plans – which aren’t that dissimilar in that they value the right to monetize assets over any multi-currency measurement of the cultural value of shared music – to a whole new place, where anyone can charge for anything, just so long as they charge. Great music is worth a hundred times what anyone can physically pay for it. Bad music isn’t worth the investment of time it takes to find out that it’s bad. Free distribution of music works because it doesn’t cost anyone anything for the sharing to happen but has the potential to accrue enormous value that can be turned into cash to pay the bills and make more music in myriad ways. I wonder what Lily’s chums at the FAC think of this one? While you’re here, if you’re a UK resident, go sign the Open Rights Group’s Petition against Mandelson’s insane plans. Because the important thing is that the consumer pays, not that the producer gains. “Robin Hood, what a crook! Gave away what he took! And bearing in mind how Lionel Bart was treated by the business, doubly apt. Has Lily ever chatted with fans at the merch table? It would seem not. The value of your music from the individual’s perspective is not at all connected to how much they are willing to spend. It would seem that Lily needs to ask her fans direct – i.e. put on a gig herself, and assuming that everyone there ‘values’ her music – she will no doubt see that a good proportion of those fans might not have bought the record, download, etc – and may instead have received it for free (i.e. from a friend, or illegally downloaded). …I’d like to see those figures, actually. Maybe, just maybe, rather than a carefully-thought-out, nuanced position that she’s arrived at only after hours of wrangling with the ethical implications of a variety of stances, this is Ms. Allen opening her gob and “speaking her brains” to that low-quality musical dishrag, the NME? She’s never given much evidence of extreme cleverness in any other interviews, so why break the habit now…? But the serious side of this is the sort of consumerist thinking – that you have to somehow be a music consumer and not be able to share music except if you are doing so for a profit – for decidedly nonmusic goals.